Nine Mile Smile was a great addition to our wedding day! They have a wide range of music and were able to learn several new songs prior to the wedding---including a surprise song. Everyone commented on how much they enjoyed the band. - they allow you to pick 4 songs for them to learn - we gave them some tough ones to learn and they did a great job! Nine Mile Smile rocked our wedding! They were the highlight of the party and kept the dance floor packed. Our friends and family still keep raving about them. I've never seen my elderly aunts dance so hard! LOL! Many of our guests have said they wished they had a band at their wedding. It truly was perfect. We had so much fun! BEST NIGHT EVER! These guys were awesome. They BROUGHT THE PARTY and were super easy to work with. Kurtis (the band contact) was super nice and flexible leading up to the big day. Whenever I sent an e-mail, they responded quickly and were an overall pleasure to work with. 9MS was phenomenal for our wedding. They were accommodating from the inception, on top of their game throughout the planning process and the day of. It seemed like each guest commented on their great performance and quality sound. They also learn 4 songs for you to play. Wonderful experience, get them booked. 9Mile Smile was the perfect band for our wedding. Kurtis was always in contact and on top of all the planning aspects well ahead of the event. The band performed specific songs we requested, as well as adapted the setlist to be more aligned with the type of music we enjoy. They were the life of the party and all guests were highly praising their talents. I would highly recommend them to anyone looking for a live band for their event. We absolutely loved having Nine Mile Smile perform at our wedding! Everyone had a great time and we received numerous compliments on how great the music and band were. Also, my husband, who is not a dancer, was on the dance floor with me almost all night. I was shocked! We had a wonderful time! Additionally, Kurtis is a breeze to work with. Super responsive and very helpful! Overall, if you like live music and having a great time dancing the night away you won't be disappointed! Nine Mile Smile was an awesome addition to our reception! We knew we wanted a band that could play all types of music to get everyone dancing, and NMS didn't disappoint! Many of our guests have since talked about how great they were! I would highly recommend NMS to anyone looking for a band for their event!! Hiring Nine Mile Smile was one of the best decisions I made when planning our wedding. They made sure everything was taken care of and ran smoothly, and were complete professionals with their equipment set-up & sound. They do a great job at playing a variety of music, appealing to the wide range of tastes that come with a large event like a wedding. Our guests are STILL talking about how great the band was! WORTH EVERY PENNY!!! The one thing I really wanted to have at our wedding was a live band and Nine Mile Smile did not disappoint. They were amazing and had everyone dancing until the very last minute. Kurtis was so easy to work with from the very beginning. He answered all of my questions quickly and thoroughly. I would highly recommend them. We really can't say enough great things about Nine Mile Smile! Our entire wedding day was so much more than we could have ever imagined, and they had such a large part in making that happen! From the very beginning, Kurtis went WAY above and beyond with communication and answering any little question we had - and he always answered almost immediately! My father really wanted our father/daughter song to be a surprise and Kurtis was excellent with communicating with him and keeping it a secret, too! During the wedding, we could really sense the enjoyment and pride that the band had in producing great music and a great atmosphere! I have even heard rumors that the guitarist at the ceremony, Mikey, may have been so "in the moment" that he may have shed a few tears :) Afterward, Jordan and Kurtis even thought to personally THANK US for the fun night! THEY were the ones who deserved the thanks! Nine Mile Smile was worth every penny and then some! I can't give them 100 stars, but I wish I could! We hired Nine Smile Smile without ever having seen them play in person. We watched a few songs online, but that was it. Throughout the planning process, Kurtis was wonderful to communicate with - he was always very quick to respond and always provided me with the information that I needed. Jordan has the most beautiful voice, and she did an amazing job with our first dance song. She also did a beautiful rendition of "Wind Beneath My Wings" for my dance with my dad. The band can play ANYTHING! My husband is a huge Dave Matthews fan, and they did a great job with the DMB song that we requested. They kept the dance floor packed the entire night! There were so many people left at the end of the night that just wanted to keep dancing, which is exactly what we wanted! 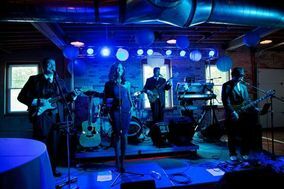 We had so many of our guests say how wonderful the band was and even had people ask for their contact information to potentially hire them for their event. 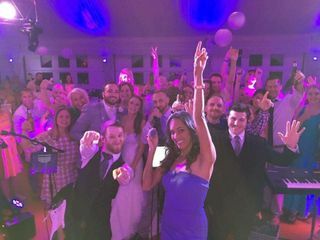 We could not recommend Nine Mile Smile enough for your wedding or next party! Super wonderful, friendly, talented band!!! Nine Mile Smile was extremely great to work with! They were extremely responsive to our requests and always remained professional. Furthermore, they can play any genre of music and it all sounds great. It was really nice of them to learn a few songs they didn't know - I would highly suggest having Nine Mile Smile play at your wedding! Nine Mile Smile was an absolutely excellent wedding band! Kurtis was a pleasure to work with. He was super responsive, answered all of my questions, and even did a walk through at our ceremony site because it was outside at a personal residence and we were concerned about power issues. The reception itself was made by Nine Mile Smile. They had a ton of energy, sounded great, and kept the partying going. Our guests actually started to boo when the reception ended because everyone was having so much fun. I can't recommend Nine Mile Smile enough if you're looking for a great cover band! Nine Mile Smile was an amazing band!! They really are what made my wedding fun and enjoyable for all of our guests! People were dancing the whole time because of the band and I couldn't have been more pleased with them! I highly recommend them to anyone! I would recommend this band in a heartbeat! Our wedding was almost 6 months ago and people are still talking about nine mile smile! They were incredibly professional from start to finish, easy to communicate with and flexible with me changing my mind or being unsure of what exactly I wanted! They kept the energy up at the wedding and balanced the type of songs really well. We couldn't be happier with our choice to have nine mile smile do our wedding!!! Nine Mile Smile was outstanding at our wedding reception. The music was perfect and the planning up to the wedding went without a hitch. Our guests couldn't stop talking about the music and we couldn't have been happier that they were able to play at our wedding. Nine Mile Smile was absolutely amazing at my wedding. They provided me with the list of songs they can see, let me even pick 4 songs for them to learn. They were very flexible at the wedding as we ran a bit behind schedule. Great band and even dj when they took their breaks. Easily the highlight of the night. I highly recommend them! Nine Mile Smile was awesome!! When planning for our wedding we knew we definitely wanted to have a live band. We searched and listened to a couple different bands, but no one compared to Nine Mile Smile! We knew we wanted them immediately after we heard them! We were so happy we chose them to play at our wedding reception. People were on the dance floor all night and everyone commented on how good they were. One of our guests told us they were the best band they had ever heard at a wedding! Kurtis was so quick at responding to all our questions and requests and they were all so professional. Friends of ours getting married next year, wanted their name so they could book them. I would recommend 9 mile smile to anyone, they were really great to work with and sounded amazing! If you're looking for a band for your wedding, don't look any further! Nine Mile Smile was recommended to us by a friend and I am so glad we went with them – they are AWESOME. Great performers and genuinely nice people. Leading up to the wedding, they were by far our most responsive (and thus favorite) vendor to work with. On the day of the wedding, they were on top of everything and so much fun. They let us get up on stage, sing songs with them, dance – whatever we wanted. They were flexible and truly a blast. We've heard (and are still hearing) so many good things from our guests. I'm serious – don't look any further! This band is AMAZING! Everyone's first comment about our wedding is how great the band was. :) Their execution was pure perfection. I'm so glad that we made the investment. It was everything I dreamed it would be and more. I can not thank or endorse them enough. Nine Mile Smile was recommended to me by a very popular wedding photographer, she has heard so many bands and says they are the best. I agree-the best!! Thank you so much! We had a great time. Everyone was so gracious. Glad you enjoyed it! We contracted with Nine Mile Smile for my daughter and son-in-law's wedding, and they were AWESOME! There are so many details to planning a wedding, and Kurtis and Nine Mile Smile made the music one of the easiest! From the first day we contacted them, all the way through the wedding, their main concern was that the music and dancing was what the bride and groom wanted, and that we were able to relax and have fun. We had FUN! The evening was very warm and humid, and our venue didn't have air. I was worried that no one would dance, but, believe me, with Nine Mile Smile, that wasn't a problem. They kept the party going right to the end! The band offers to learn 4 special songs for the event; one of the songs our kids chose was Remix to Ignition. The band commented that it was one of the hardest they had ever had to learn, and then they played it like it was a piece of cake! Our guests are still commenting about our wonderful band. My son-in-law is a musician with a band that plays clubs in Chicago. As we were interviewing bands, we asked several of them if he could join them on stage for a song, and the request was turned down every time--some of the responses were very strange. So, when we were contracting with Nine Mile Smile, we didn't even ask. And then, a week or so before the wedding, Kurtis emailed and invited him to sing a song or two with them! You can rely on musicians to know quality music. We listened to so many music tracks from bands across the mid-west. We interviewed a handful. We hired Nine Mile Smile, and we would do it again. You won't be disappointed if you hire them! I was expecting Nine Mile Smile to be a good band with there reviews, but in all honesty they were fantastic beyond my expectations. They played all the songs we requested and even let me get up on stage and sing to my new bride "You are so Beautiful" which she was. I loved that they MC ed the evening and made the whole event flow smoothly. I would recommend them to anyone looking to add something special to the most special night of our lives. I can't stress enough how amazing this band is! They were SO awesome throughout the planning process and the night of the wedding. Kurtis was amazing to coordinate with and I would highly recommend this band to anyone and everyone! They had the crowd on their feet the ENTIRE night and people are still raving about them today! Seriously - BOOK THIS BAND!!! I can't wait to hire them for another event sometime in the future. My husband and I agree our wedding was the most fun we've ever had, thanks in no small part to Nine Mile Smile. When we chose our venue NMS was the recommended band, we had never heard them so we snuck into another reception to hear them and we were sold within 60 seconds. Kurtis made the process easy and convenient from the initial contact through the reception. We wanted to make our own playlist for the cocktail hour (we aren't really soft jazz kind of people) and Kurtis was happy to accommodate our online playlist for the cocktail hour and during the very short breaks they took. That night and in the time since I have had TONS of people say our wedding was the most fun wedding they have ever attended and specifically called out NMS as being amazing! They learned Uptown Funk for us and it was a HUGE hit, especially with my 5 year old nephews who love that song! My husband and I hardly left the dance floor we were having so much fun. I would HIGHLY recommend NMS to anyone for their wedding. Whatever your musical style is or your crowd's style NMS will accommodate from their large set list. The music at your reception can make or break it and NMS will ensure an amazing time for everyone! I can't say enough how much fun we had and how great Nine Mile Smile is! !